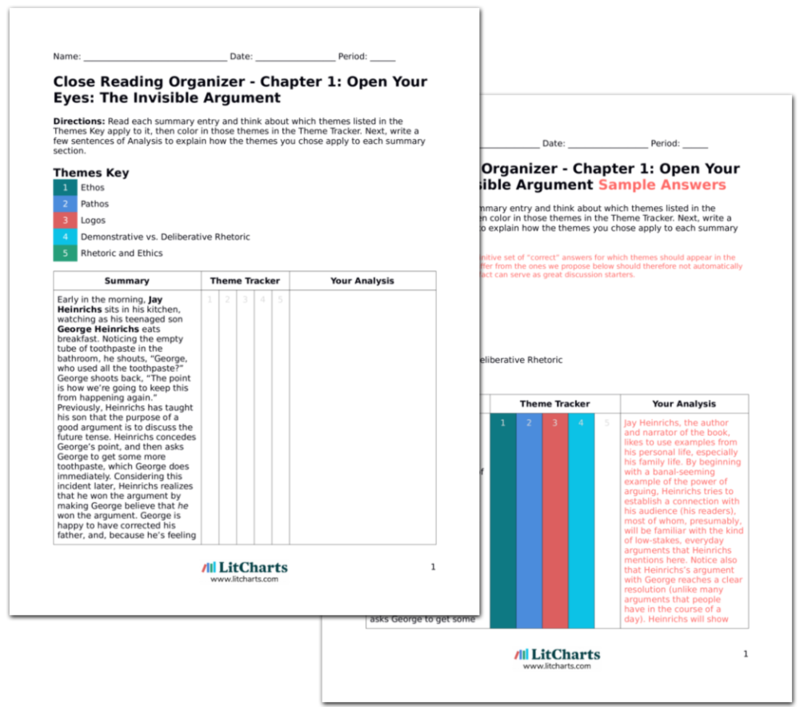 Instant downloads of all 939 LitChart PDFs (including Thank You for Arguing). The adult son of Jay Heinrichs, who figures in many of Heinrichs’ examples of rhetorical technique. The wife of Jay Heinrichs, who figures in many of Heinrichs’ examples of rhetorical technique. The daughter of Jay Heinrichs, who figures in many of Heinrichs’ examples of rhetorical technique. Writer, theologian, and a key figure in the history of Christianity, who used his extensive rhetorical training to convert thousands of pagans. Actor who played a famous fictional character in the movie Animal House, cited by Jay Heinrichs as an example of someone who fails to establish his ethos by emphasizing his practical wisdom. 43rd president of the United States, praised (only half-seriously) by Jay Heinrichs for his unique rhetorical flair. A likable Italian man who Jay Heinrichs meets during a trip to the Italian Riviera. Ancient Roman politician and orator. Lawyer famous for defending O. J. Simpson in his 1994 murder trial. Democratic president candidate who lost to George H. W. Bush in the 1988 elections. Rapper and actor whose rap performance at the end of the movie 8 Mile is a masterpiece of decorum, in the sense that it creates a strong bond between Eminem and his audience. Fictional character in the novel To Kill a Mockingbird, cited by Jay Heinrichs as an example of someone who fails to establish his ethos by sharing values with his audience. Head of the NFL during the 2012 referee controversy. Founding Father and orator, who borrowed his best-remembered line, “Give me liberty or give me death!” from a play about the ancient Roman politician Cato. Fictional detective and a master of deductive logic. 31st president of the United States, cited for his failure to prove his practical wisdom and ethos. Fictional doctor from the TV show House, and an exemplar of practical wisdom. Founder and former president of Apple, notable for often refusing to apologize for his mistakes. A friend of Annie, and a staunch Republican. 35th president of the United States, remembered for his quote, “Ask not what your country can do for you; ask what you can do for your country,” one of the most famous and elegant uses of the rhetorical art of chiasmus. Democratic candidate for the presidency in 2004, defeated by George W. Bush. Civil Rights hero and a master of kairos. 16th president of the United States, notable in Thank You for Arguing for his masterful rhetoric and his skillful manipulation of his audience. Renowned political dissident during the era of apartheid in South Africa, and eventual leader of South Africa. Early Chief Justice of the Supreme Court of the United States. 37th president of the United States, cited as an example of someone who failed as a politican because he failed to establish his ethos by emphasizing his shared American values. 44th president of the United States, praised by Jay Heinrichs for his first-rate rhetoric. Famous Hollywood actress who appeared alongside Jimmy Stewart in It’s a Wonderful Life. Famous Hollywood actor who appeared alongside Donna Reed in It’s a Wonderful Life. Republican candidate for president in 2012. Secretary of Defense under President George W. Bush. Famous American football player who was later prosecuted for the murder of his wife and defended by Johnnie Cochran. Totalitarian leader of the Soviet Union, notable also for his masterful understanding of kairos. 20th century Christian saint, notable for her disinterested aid to the poor and suffering. Renowned 19th century American senator and orator, who Jay Heinrichs praises for his ability to use pathos to convince his audiences. Famous 19th century poet, playwright, and wit, praised by Jay Heinrichs for his talent for manipulating figures of speech and figures of thought. Beloved 20th century humorous novelist. Controversial preacher who caused a minor scandal in the 2008 presidential campaign of Barack Obama. Arn, Jackson. "Thank You for Arguing Characters." LitCharts. LitCharts LLC, 2 May 2017. Web. 17 Apr 2019. Arn, Jackson. "Thank You for Arguing Characters." LitCharts LLC, May 2, 2017. 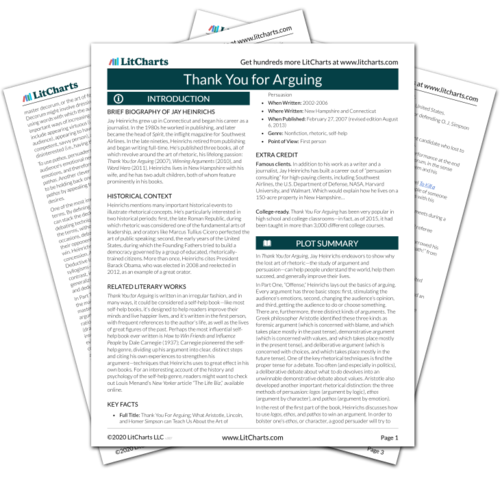 Retrieved April 17, 2019. https://www.litcharts.com/lit/thank-you-for-arguing/characters.